In line with their Buddhist beliefs, the Bhutanese have always lived in harmony with and with great respect for their natural world. One of the planet’s 10 biodiversity hot spots, you’ll find dense forestation, lush green valleys, snow-capped peaks and ice blue lakes alongside over 165 species of mammal. It is a land of tigers, elephants and butterflies; monkeys, sheep and yaks, not forgetting the majestic snow leopard. Up in central-northern Bhutan, the Wangchuck Centennial Park only came to be in 2008 and captures middle Himalaya’s landscape of blue pine forests, wolves and black bears, while further south, the Royal Manas National Park is the oldest in the kingdom and includes habitats from lowland tropical forest to fields of permanent ice. As well as being the only park that the greater one-horned rhino chooses to call home, the Royal Manas is a twitcher’s delight with over 360 species of bird. 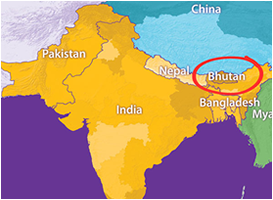 Due to Bhutan’s location and unique geographical and climatic variations, it is one of the world’s last remaining biodiversity hot spots. Bhutan pristine environment, with high rugged mountains and deep valleys, offers ecosystems that are both rich and diverse. Recognizing the importance of the environment, conservation of its rich biodiversity is one of the government’s development paradigms. The government has enacted a law that shall maintain at least 60% of its forest cover for all time. Today, approximately 72% of the total land area of Bhutan is under forest cover and approximately 60% of the land area falls under protected areas comprising of 10 national parks and sanctuaries. Each of Bhutan’s National Parks and Wildlife Sanctuaries are an essential part of the Bhutan Biological Conservation Complex – a system of national parks, protected areas and forest corridors covering 60% of the country. Each of these parks and sanctuaries has its own special character and are home to endangered animals, birds and plants.